Having been briefly knocked to 11.85 at the FOMC announcement, the VIX spent Thursday in floor building mode, settling -2.2% @ 12.22 (intra low 12.09). 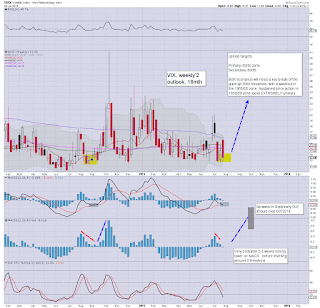 Near term outlook offers renewed equity downside, which should equate to a VIX weekly close in the 13/14s. Suffice to add, market is back in complacency mode.. but broadly... I remain expecting much higher volatility levels as we proceed into August.. and all the way into early October. *I hold long-VIX from the low 14s.. seeking my next exit in the 16/17s. US equities closed moderately mixed, sp +0.1pts @ 2108. The two leaders - Trans/R2K, settled u/c and +0.2% respectively. Near term outlook is offering renewed side, but the equity bears really need some sustained price action under sp'2090 to offer clarity that the Wed' high of 2110 was just another marginally lower high. Not the most exciting of days... indeed, with the morning spike from 2094, it was a pretty frustrating day for those in bear land. Yet.. from a pure cyclical perspective, the setup does favour the bears into the weekly/monthly close. 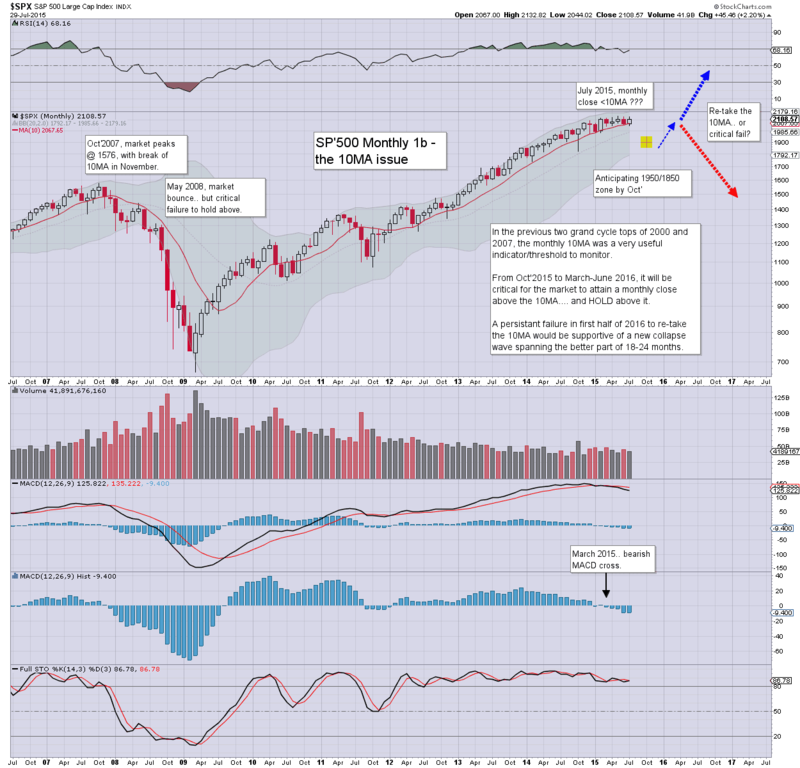 I would be surprised if we don't see a monthly close <sp'2100.. along with VIX 14s. *I hold long-VIX, and short-INTC overnight. US indexes look set to close moderately mixed, with the sp' having bounced from a Monday low of 2063 to 2110. Equity bears need a daily close in the 2080s - along with VIX 14s to offer clarity that this recent move was just another bounce. A daily close <sp'2100 looks difficult, but regardless of the exact close... market looks tired.. and set for some weakness into the weekend/monthly close. notable weakness, miners, FCX -4.8%, GDX -3.6.. as Gold -$9... falling into month end.. as is typical. *I will hold long-VIX, and short-INTC overnight..
Not exactly warm though.. just 60f. With the FOMC and GDP data out of the way, the market should (in theory) be able to more easily pick a direction.. and run with it into August. The hourly cycle setup continues to offer renewed equity weakness.. into the Friday/monthly close. Well... this market sure looks tired.... yes? Equity bears could do with a daily close <sp'2100.. along with VIX in the 13s. Considering we had both of those targets this morning... it is not an overly bold hope. 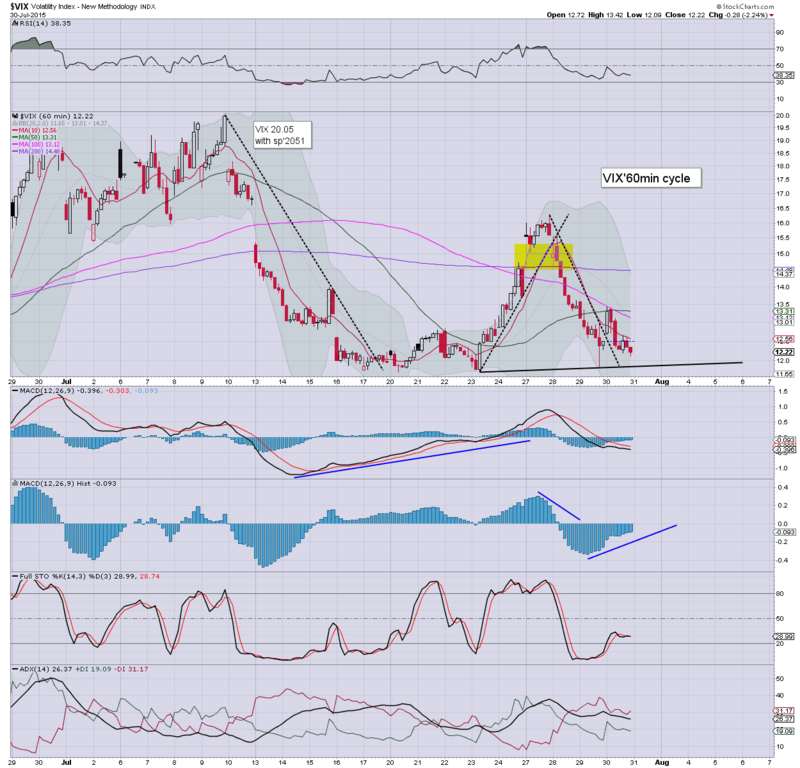 *I remain long-VIX, and short-INTC (from an hour ago.. $28.90s). As things... I am more than content to hold both of those trades into next week, but if there is some sig' downside tomorrow.. I'll likely drop both into the weekend.. as I try to do for any option positions. So... the question I'd ask anyone is... '...would you expect VIX to be sustainably trading under the FOMC spike low of 11.85?'. 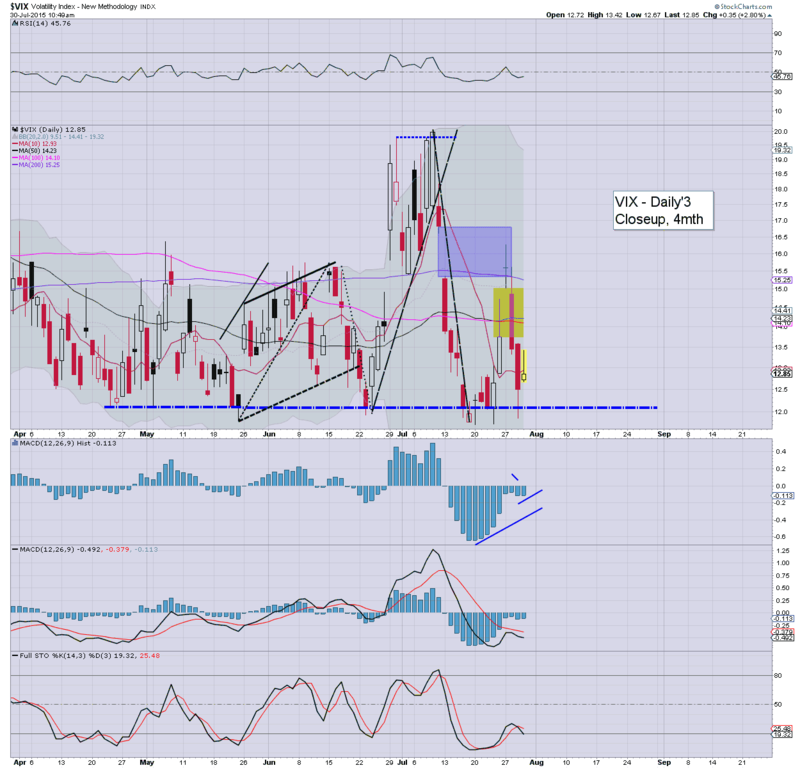 Personally, with the VIX at these levels... it seems just a matter of a few days before the VIX is back in the mid teens. Once the Monday high of 16.27 is held above... then the low 20s will be viable... and quickly. 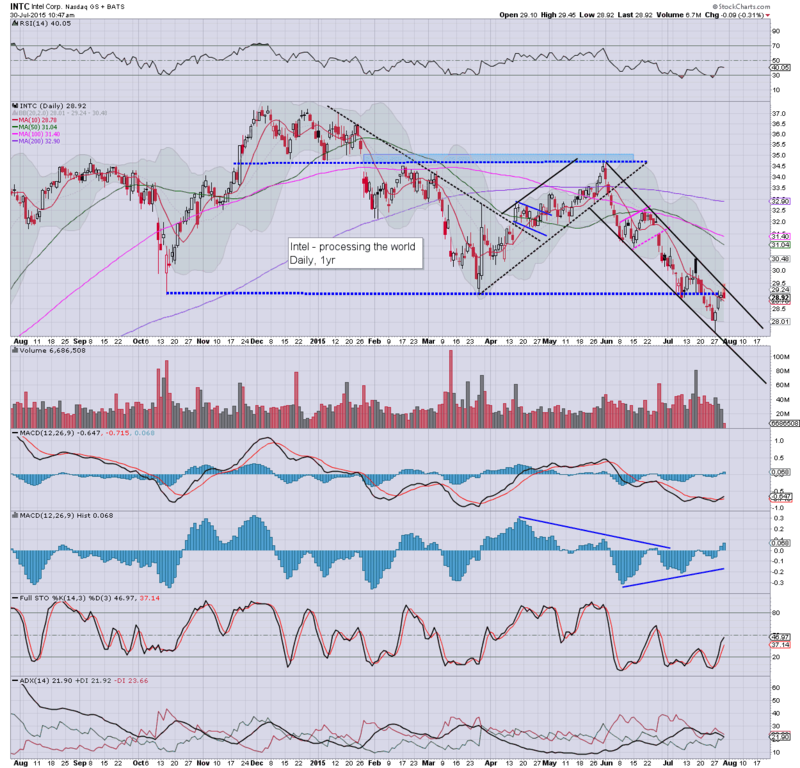 *after some consideration, I am SHORT-INTC, from the $28.90s. I have an initial target (as I have had for over a month) of the 26/25s by early Oct. 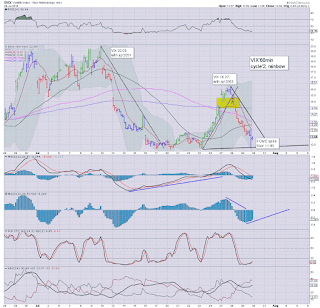 However, the H/S scenario is suggestive of $22.50. US equities remain moderately weak, as the market is battling it out around the sp'2100 threshold.. where the 50dma is also lurking. With the USD +0.6% in the DXY 97.60s, commodities remain under some pressure, Gold -$5, although Oil is now +0.2%. *I see that the infamous Gartman is no longer bearish. Well... there is your sell signal. For the equity bears its somewhat frustrating... as for now, there is no significant downside power. 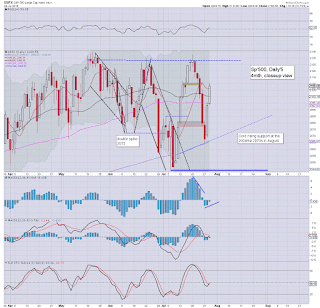 Now its a case of whether we'll see some stronger downside action into the weekend/monthly close. The setup still favours the equity bears. 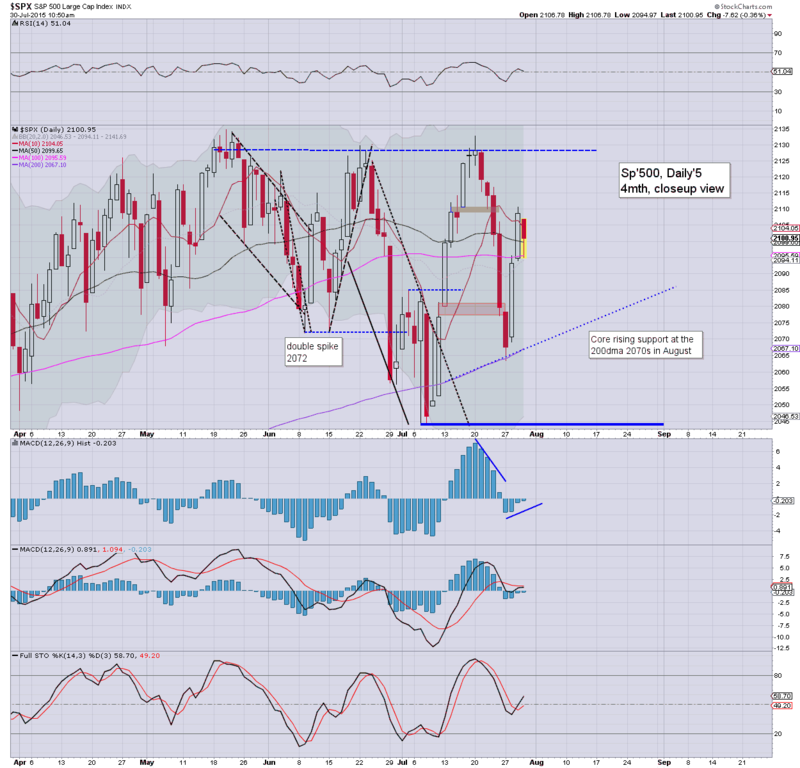 US equities are seeing some weak chop, with an early low of sp'2094. 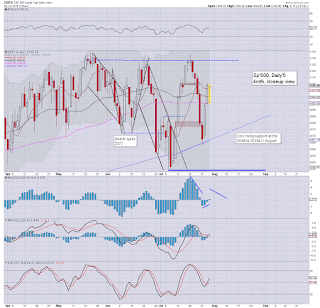 It remains the case that with the VIX already low, how are equities going to be able to push higher into August? 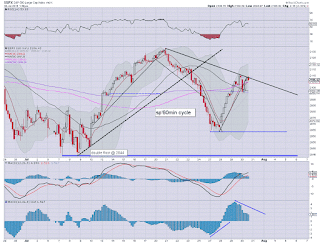 Cyclically, the setup favours the equity bears into the Friday/monthly close. 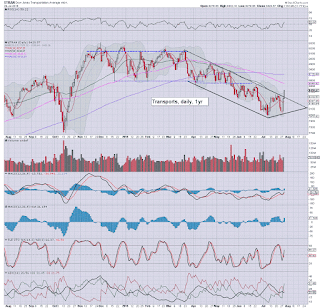 *note how sp'2090 is kinda an interesting level on the sp'500 chart. If we see any price action in the 2080s.. it'd be suggestive of 2050s.. if not a lot lower in August. 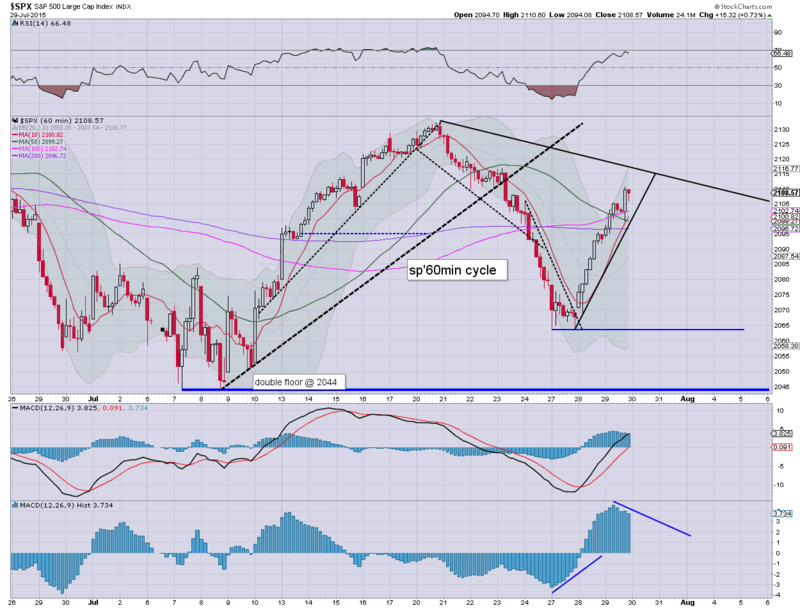 Despite the recovery/bounce, we do have a break of trend.. in both equities and VIX. 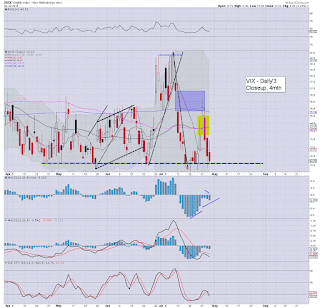 Daily MACD cycle on the VIX is offering a warning that despite a two day equity bounce... we're so low on the cycle.. there really is only one way for the VIX to go from here... UP. *I remain long-VIX, and have little interest in exiting until at least the 16s. notable weakness: FB -4% in the $93s. US equities open moderately lower, as Q2 GDP (2.3%) marginally disappoints the mainstream. With the USD +0.6% in the DXY 97.50s, commodities are under pressure. Gold -$12, with Silver -0.7%, whilst Oil is -0.5% in the $48s. 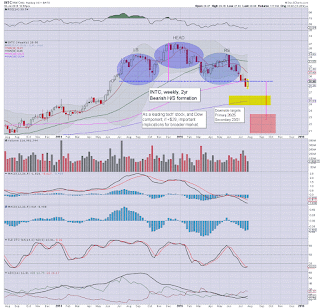 Well, we're in the tail end of the month... and as I noted last night.... the monthly closes will be rather important. 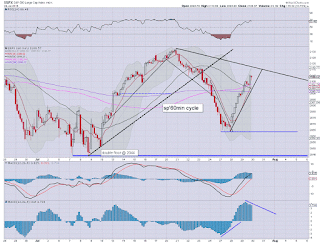 As it is... the sp'500 should comfortably hold above the 10MA (2066)... but other indexes are already busted. 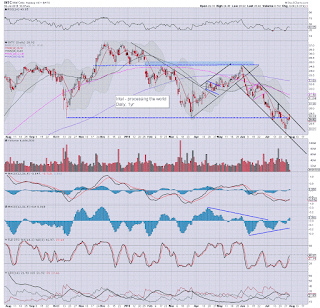 notable weakness: AAPL -1.0% in the $121s.. a loss of 120 would be a major warning of trouble for the broader market into August. Good morning. Futures are a touch lower (ahead of GDP data), sp -2pts, we're set to open at 2106. USD is building early gains, +0.4% in the DXY 97.30s. Metals are weak, Gold -$10, with Silver -1.0%. Oil continues to climb, +0.4% in the $49s. With the FOMC out of the way until mid Sept', the way forward is a little simpler from here. Now it is simply a case of whether we see new highs in 'some indexes'... before breaking lower... or see another failure in the near term.. and then take out the recent key low of sp'2044. 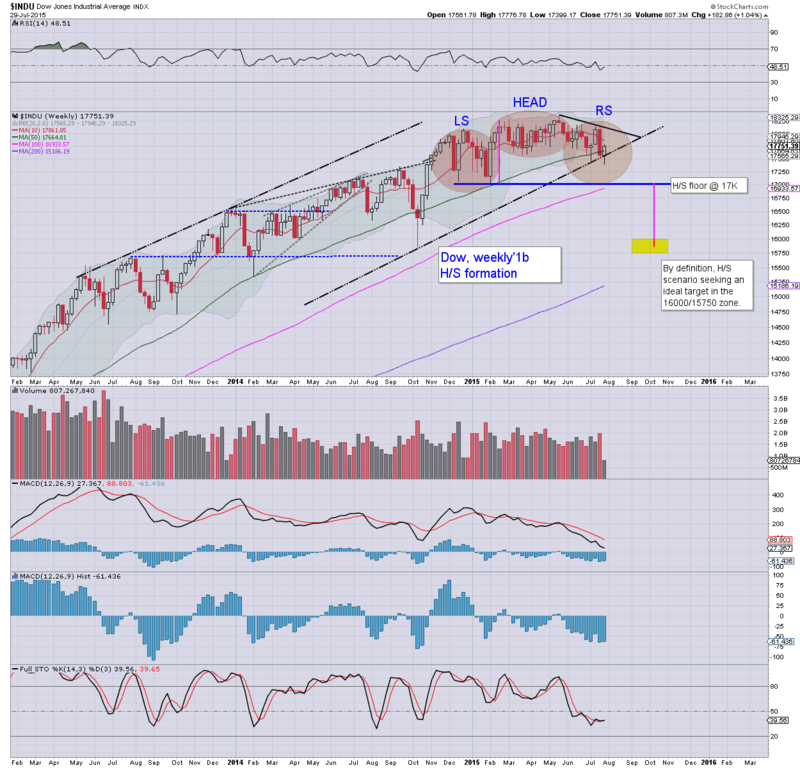 It remains notable that a number of indexes recently broke the equivalent level of sp'2044. Then there are the trend breaks on the bigger weekly/monthly cycles, but few seem to have noticed that rather important development. *I remain long-VIX... and frankly, considering we're now already in the 12s.. how much lower could it go anyway? Hourly equity/VIX cycles continue to threaten an equity down wave into the Friday/monthly close... the setup does NOT favour the equity bulls across the next two days. WFM -14%, after a marginal earnings miss, back to the low from last Oct', $35s. 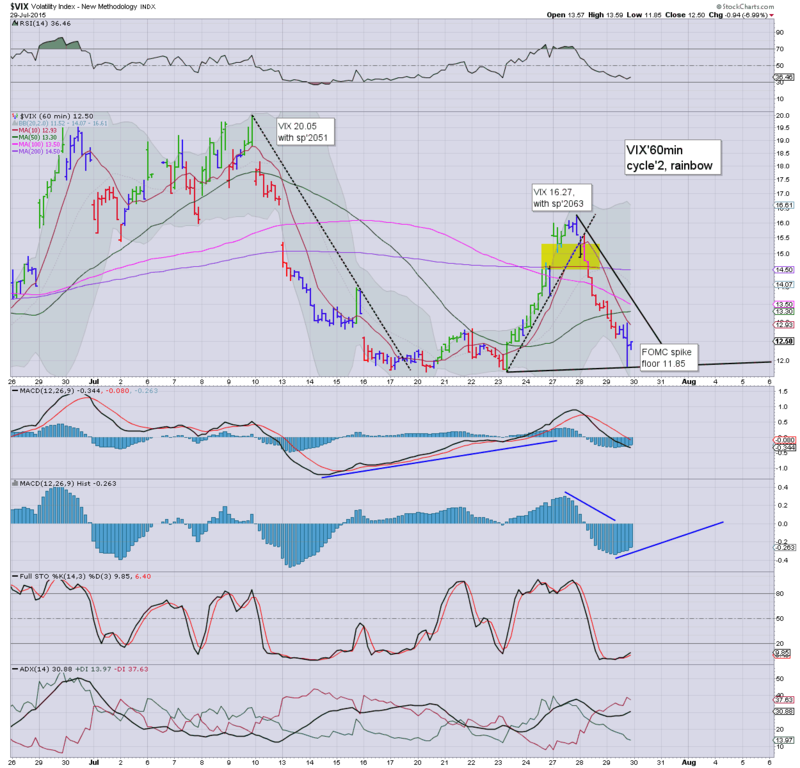 GDX, -2.4%, as the precious metals continue to weaken, Gold is headed for the giant $1000 threshold. Overnight China action: The volatility continues. with the Shanghai comp' seeing a lot of chop.. but then a sharp sell down in the late afternoon, settling -2.2% @ 3705. The recent low of 3373 really isn't more than 1-2 trading days of declines away. *standing by for Q2 GDP data - due 8.30am EST. Broadly.. a 'bearable' number for the market... not great... but not dire either. Further, the revision for Q1 negates the recessionary threat. Metals under increasing pressure as USD claws upward, Gold -$14. 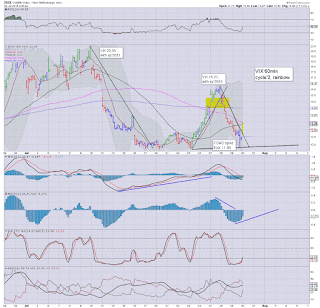 Equity bears should remain seeking a daily close back under sp'2100.... along with VIX 14s.. for the weekly/monthly close. 9.13am.. sp -8pts.. set to open at the 2100 threshold.... that will probably equate to VIX 13s. A daily close <2090 would be useful... with VIX 14s.. but I realise most would argue that is out of range. 9.44am.. Clear breaks all over the place.. VIX 13.18... with sp'2097. Mining stocks imploding. GDX -3.7%.... 100% horror. How will the month close? It was a second day of gains for the US equity market, sp +15pts @ 2108. A more important issue though is how will the month close? 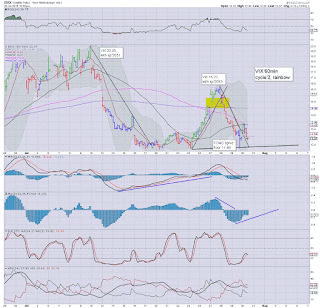 Will there will be further upside.. with a sig' net weekly gain - making for another monthly close above the key 10MA (2067)... or will the market unravel into the weekend? 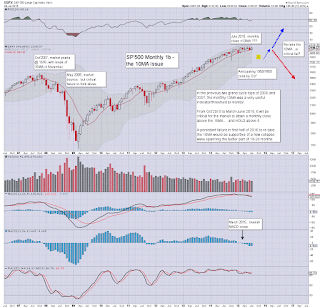 A monthly close under the 10MA on the sp'500 looks very difficult.. unless the market gets badly spooked by GDP data tomorrow. 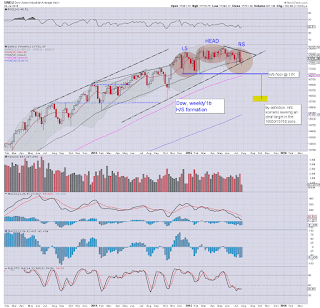 re: Dow... despite the current net weekly gain of 1.0%, we did have a break of trend on Monday, and until the Dow is breaking new historic highs in the 18400s.. the bull maniacs can't get overly confident of the autumn.. and winter to come. Thursday will see Q2 GDP data, market is expecting growth of 2.9%, which to me seems overly optimistic. I remain (perhaps overly) focused on the VIX, but for me... that is where I believe the 'big money' might be made across the next few months. With further weakness today, the MACD (blue bar histogram) cycle saw a bearish cross on the weekly cycle. 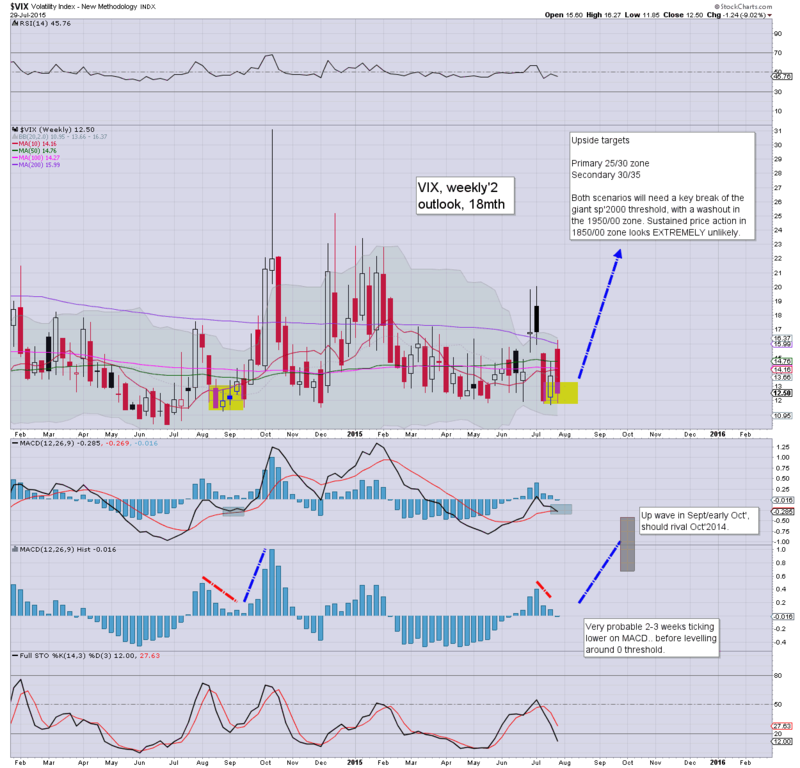 I want to see the VIX pick back up by the Friday/monthly close into the 14s. That would negate the cross... and keep the original scenario intact. 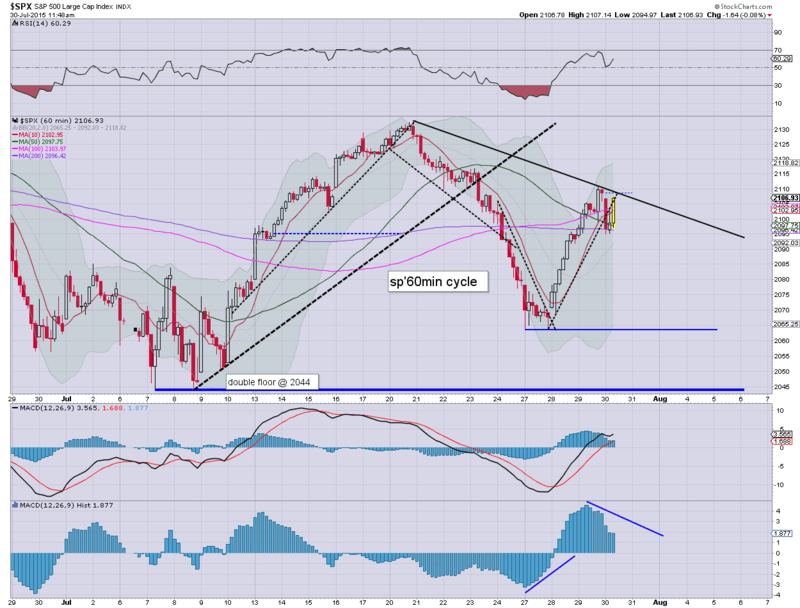 US equities closed broadly higher, sp +15pts @ 2108. The two leaders - Trans/R2K, settled higher by 1.7% and 0.5% respectively. Near term outlook is mixed, with the hourly cycles offering a down wave across Thurs/Friday, but the daily close >sp'2100 (where the 50dma is lurking) is a rather bullish signal for early August. 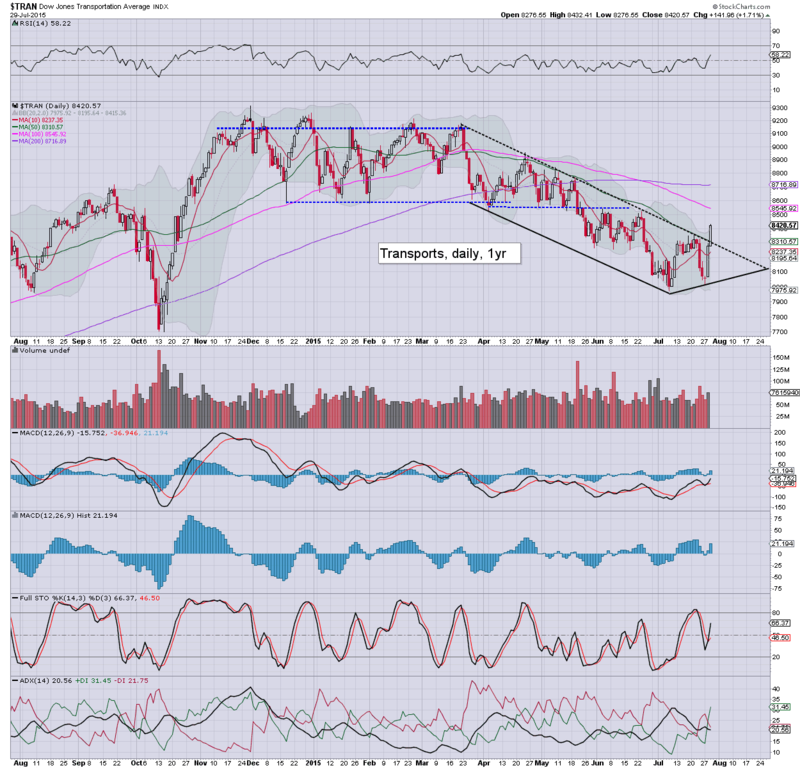 *the market laggard - Trans, has seen a rather decisive break above declining resistance/trend. Right now, it the most bullish break of trend that I'm aware of. 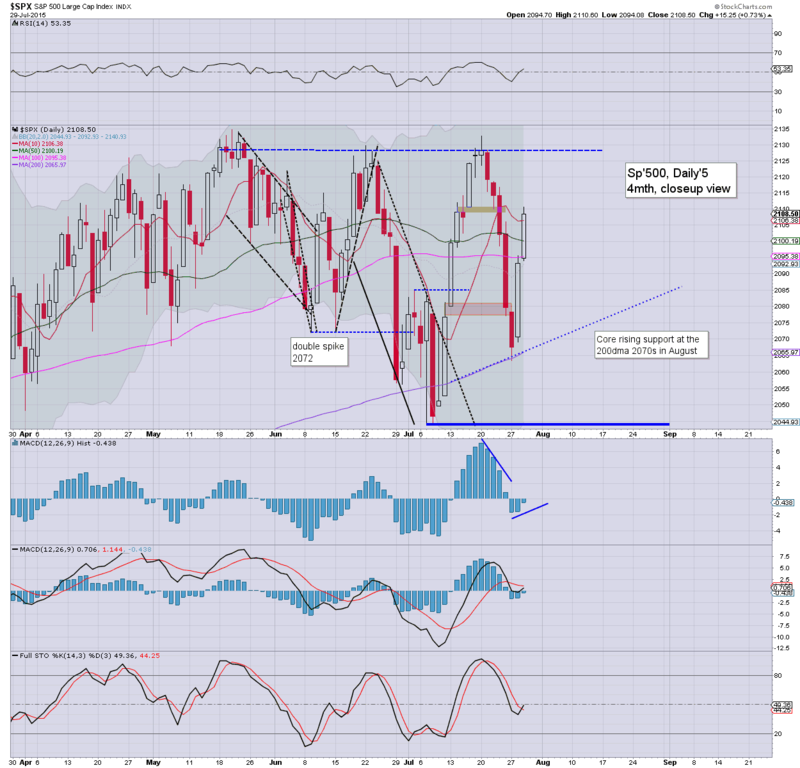 The sp'500 close above the 2100 threshold.. and the 50dma was particularly bullish, and offers broader upside into August.